Teach the children. We don’t matter so much, but the children do. Show them daisies and the pale hepatica. Teach them to taste the sassafras of wintergreen. The lives of the blue sailors, mallow sunbursts, the moccasin flowers. And the frisky ones - inkberry, lambs’-quarters, blueberries. And the aromatic ones - rosemary, oregano. Give them peppermint to put in their pockets as they go to school. Give them the fields and the woods and the possibility of the world salvaged from the lords of profit. Stand them in a stream, head them upstream, rejoice as they learn to love this green space they live in, its sticks and leaves and then the silent, beautiful blossoms. Children have the potential to develop life-long healthy habits by learning about nutrition at a young age. One of the sub-groups of our Practical Life exercises in the Children's House, is care of self. 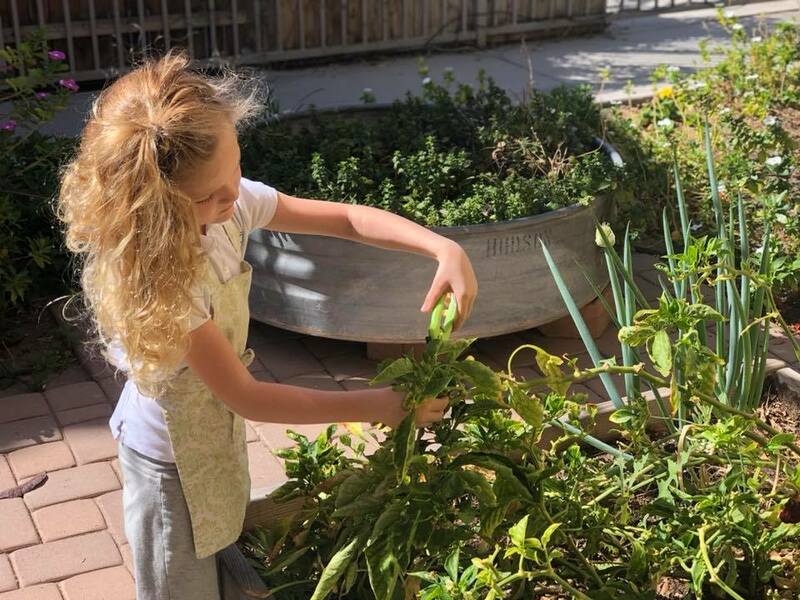 It is important for the children to create a positive relationship with food in preparation for understanding the interdependencies and connectedness of our planet. They will also develop an appreciation for what they’re eating, where it came from and what it’s doing for their body. There is no better way to provide this kind of education than in a hands-on way. It truly just requires some creativity and time spent with your child(ren). A good way is to start simple: invite your child to help you cook in the kitchen, visit your grocery store and name all of the produce. Cooking with kids not only helps to expand their palate; but can ignite some fantastic conversations. After purchasing food from the grocery store, you can identify where all of the produce came from, i.e., California, Guatemala and create a “food map.” This can prompt even more conversations about how nutrients are affected when the food travels long distances. Instilling ideas of the consuming quality food can certainly make an impact. With the bright Arizona sun, we can grow herbs indoors all year long. We can also create small garden spaces on our patios or in our backyards for the children to tend to. Children can plant and grow tomatoes, squash, lettuce and herbs even in small garden box! Beginning with seeds or simply sprouting seeds on a windowsill can offer the child a learning experience. For example, wrap a dried bean in a damp paper towel, place it in a transparent cup on the windowsill and wait a few days. Your child can observe the growth step-by-step. When children are actively engaged in growing, purchasing or preparing food, they are more likely to try new things. Your child may be more inclined to try those “dreadful” green beans at dinner if (s)he feels a sense of accomplishment over helping them to get on his/her plate. Learning to use a knife is step one. A great way to show technique is with bananas. This is a great activity to develop fine motor skills. Composed of calcium carbonate, eggshells are an excellent way to introduce this mineral into the soil. Watching the seeds you plant sprout into vegetables is true magic. Understanding where salt come from. Tending to their garden promotes satisfaction for a job well done. 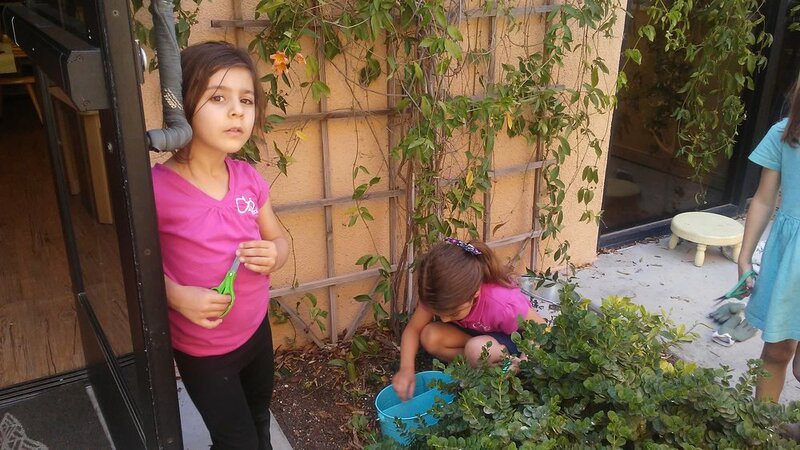 Learning to prune dead plants and replace them helps the child to understand life cycles. Developing a healthy relationship with fruits. Learning to wash up before mealtimes helps kids stay healthy. 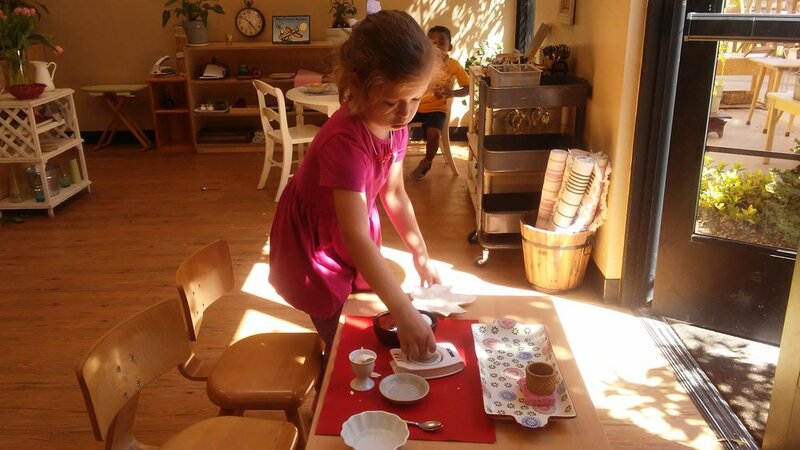 Contributing to meal times includes learning how to set the table. Learning to follow a complex sequence helps create mental order. The child is helping the garden grow. Working in the garden offers many opportunities to refine motor movements. Developing concentration, independence, control of movement and care of self. Providing healthy options for snacks encourages the child to try new things. Baking these tasty treats requires a great deal of concentration. The children develop many skills through baking including measuring. The children enjoy a visit from a special guest who taught them about gardening. April was a wonderful month in our Children’s House. We welcomed Max into our group and we appreciating getting to know him. The children were excited to have a Student Teacher to work with, Ms. Tess brought lovely energy and we wish her well on her future endeavors. Our garden had a face-lift; thank you to Abby’s grandma for volunteering her time one afternoon. Spring conferences are right around the corner. I look forward to sharing my observations and your child’s progress with you. In addition, our social will be the evening of Wednesday, May 9th. This will be a charming opportunity to come together one last time to conclude the school year. We encourage all families to join us for a potluck and lots of laughter. The child learns to create quantities several times in a more abstract way. This exercises also highlights making exchanges. The child works with verb extensions including conjunctions, nouns and articles. The child works with three part cards for the musical staff. The child learns to measure with a funnel to create beautiful arrangements; caring for the environment. The child learns muscle memory and the spoken SOUND for the letter. The child acts as a detective, eliminating variables of 120 triangles to discover ONE. This shows the child the POWER of the adjective. This is a concrete material encouraging memorization of multiplication facts. The child compares the short chains (cubed). To show each number through a single object separate from the others: quantity as a single entity. To show that not every quantity is evenly divisible, and to show that some quantities are divisible only by a few numbers. To focus the child’s attention on the few combinations he still needs to memorize, serving as a test of know facts. Developing concentration and caring for the environment. The child works with word problems and deciphers which operation is represented. It has been such an amazing few weeks in April. The children are enjoying receiving lessons from our Practice Teachers Ms. Laura and Ms. Sarah. They bring such a great energy to the classroom with new songs, games, and their own special teaching flare. We have been busy discussing recycling, reusing, repurposing, composting, litter, and Earth Day (April 22) and how we can be good stewards of the plant earth. On Friday, April 20th, we plan on taking a nature walk around campus and pick up trash. Our Spring Social is on Monday, May 7th and our theme is “Spring Fling with a twist of rainbow.” I hope everyone gets a chance to attend and spend some well deserved down time with our lovely community. I look forward to seeing you there!! This exercise helps develop the sense of smell and give the child an awareness of the many scents in the environment. Awareness of the function of the conjunction as a word that connects. Connecting and labeling the phrases. In this exercise, the child begins to analyze and synthesize the graphic symbols of the written word. This color box is the third in the series of color tablets. The child works with the gradation of colors from dark to light. Practicing the formation of the numbers 1-9. Working on a chalkboard helps with the lightness of touch and fine motor skills. Placing these tablets from darkest to lightest develops the chromatic sense. Chalkboards are an aid to handwriting in which the child refines his movement of recording conventional writing. Researching the many flags of the world. Using the moveable alphabet to build the names of the continents and create his own map. Exploration of the United States map using the moveable alphabet, drawing the states, researching flags, and writing the names on the map. Association of the quantities and symbols of the numbers 1 - 10. This work is also preparation for the odd and even work. This continuation of counting work gives the child another exposure to counting in a series and more linear counting practice. This exercise allows the child to build a word and then write it on a chalkboard or paper. Addition with the decimal system shows the child that putting together quantities makes a larger quantity. This child is practicing his letter formation while writing his name. This last multiplication chart helps with the memorization of the essential multiplication combinations. What a wonderful month we have had. The children have really grown a lot and with this beautiful weather they are completely enjoying the outdoor environment. Thank you to Mrs. Ginger, Catie’s mom, who is an expert on gardens. She came to plant more fruits and vegetables in our former sad garden, which is now looking beautiful! The children are very proud of it and make sure to water all the seeds everyday. Thank you also to Mrs. Mahsa, Rose’s mom, for sharing with the children a lesson about Persian New Year. She brought a beautiful tray with all the items that represented their cultural celebration. We would also love to thank all the families who were able to attend the monthly Parent Nights. 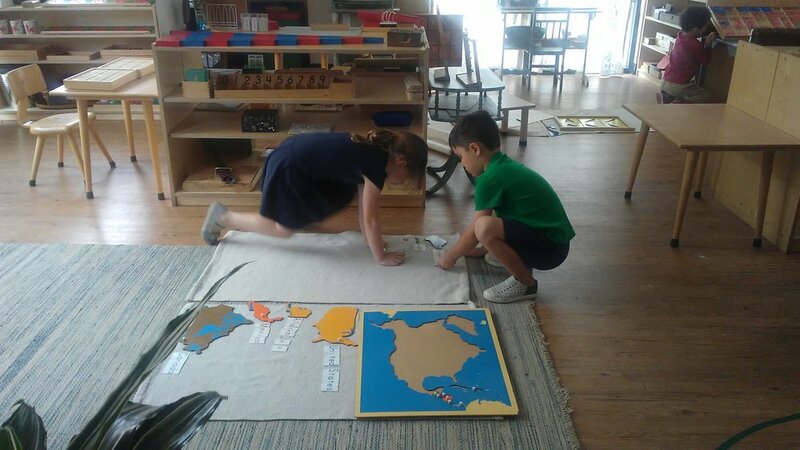 It is wonderful to be able to share with you what we do in the classroom and how the Montessori materials work. As the end of the school year is soon approaching us, we are looking forward to continue to observe the children grow and enjoy this explosion of work that is happening in our classroom. The symbols used by the child to label the parts of speech while diagraming a sentence. Oh Joy! Spring is here! This past month has been a very exciting one! We have welcomed some new friends to our environment from the toddler classroom and we are all busy getting acquainted with one another and showing the ways of the classroom. This month our baking recipe is cinnamon rolls. As part of this work the children are required to grind a fresh cinnamon stick for the recipe. 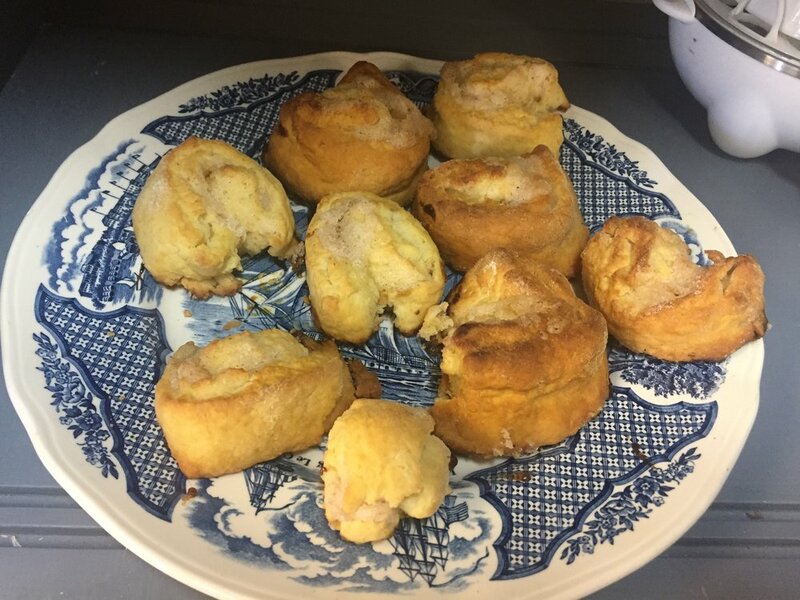 With this more involved recipe we have definitely experienced a few trial and errors. This is always good to encourage the try, try again attitude. The aroma from the oven in our classroom is truly divine! We also have welcomed our new Bobcat lead, Ms. Julia, with big, open arms. It has been such a delight having her in the classroom and we are just so excited that she gets to spend a whole month and a half with us before the complete transition to lead. Yay! She builds the numbers with stamps with spaces in between each one. She then slides them together, counts them all up, and records the sum. The child develops a story using the print alphabet. She focuses on the use of capital letters and punctuation and records her story on paper to share at home. The way the stamps are used in this operation shows the children that subtraction is the opposite of addition. To show the child that multiplication is just adding the same number a certain number of times. This problem required the use of two tables and making more stamps out of paper! 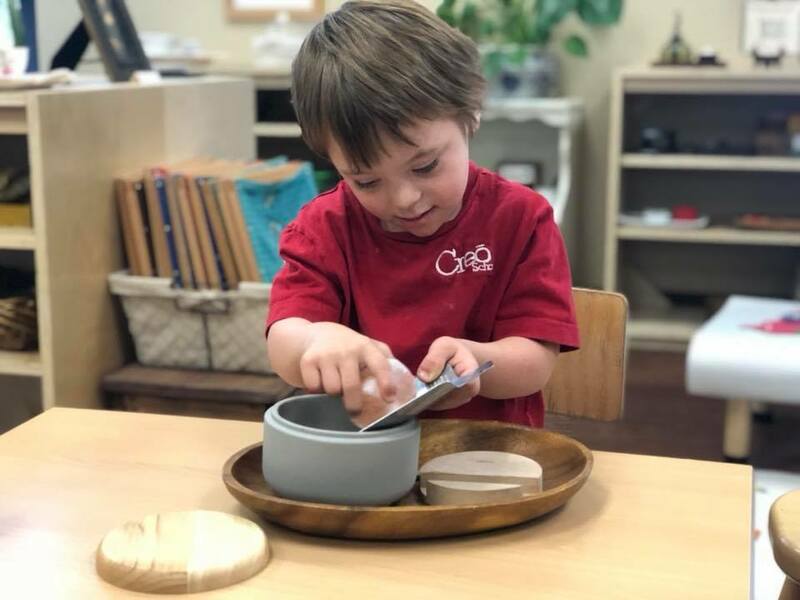 The child mixes all the objects together in a large container, then, wearing a blindfold, she feels them and sorts them into smaller containers according to their differences. Each child is responsible for cleaning their snack dishes once they have finished and then resetting the spot at the snack table of the next classmate to enjoy. The children use their gross motor skills to rake, shovel and clear away any leaves or debris form our outdoor plant environment.